Hi! What a great find! I think I will come back and visit you again. Fantastic! I always love it when I go to someone’s home and ask about a piece of art and there’s a great story behind it. I love barns. The picture is very nice Randi. I’m glad you are enjoying it. Randi, I love the picture and the frame is perfect for it. It’s wonderful that you have it to enjoy and I’m sure your cousin would be thrilled that it found the right home. What a nice picture to have – its subject gives a reminder of your ancestry and the painter was a family member! Wow – lucky you, Randi! Display it with pride and pass it and the wonderful memories on to your son! How wonderful! 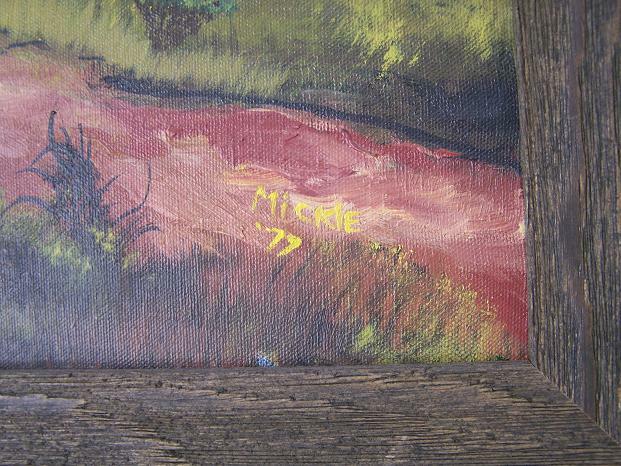 It’s a great painting, but the family connections and sentimental value make it priceless. A lovely painting and the frame you selected was just perfect. Randi – it’s a great picture and the frame is perfect. 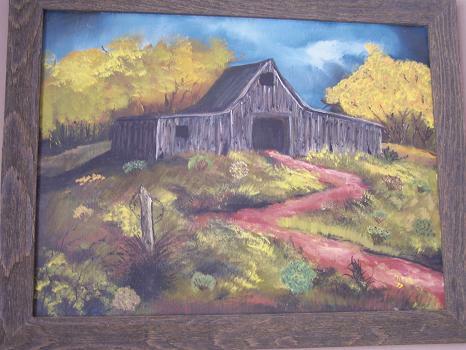 I have some wonderful paintings by my favorite great aunt that I wouldn’t part with for a million bucks. Randi what a great piece of art AND family history! It is beautiful and your frame is perfect! Your cousin Mickie left a wonderful piece behind…how lucky for both of you, that you found it and appreciate it’s value. How wonderful that you were finally able to frame this precious painting! It’s a very special family treasure indeed! I’d love to see that old barn in reality! By the way, I very much like the snow fakes on your site, too! Best wishes from Germany and Happy New Year! It’s lovely, and I think you made the right choice for a frame! What wonderful art work – and even more wonderful memoires. What a wonderful show and tell! The picture is a beautiful reminder of your childhood memories! I’m so glad you found it! « Oh Santa Baby, I Love You! !